1. Place record on its record sleeve on a clean firm surface. 2. Place record on its record sleeve on a clean firm surface. Place 3 drops of POWER CLEANER on applicator. Do not apply excessive POWER CLEANER to the record or spots of residue may form. 3. 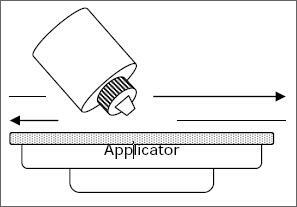 Spread POWER CLEANER evenly by moving the bottle nozzle back and forth across the applicator. Recap POWER CLEANER bottle. 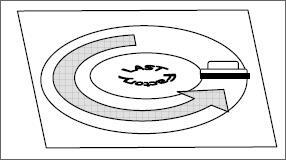 (step 5) each quarter turn. 5. Remove excess dust from applicator by moving applicator velvet across the ruffled portion of the POWER CLEANER bottle cap. 6. If excessive POWER CLEANER is applied to the record and spots of residue form, let the record dry and reclean the record following steps 1 through 5. Following cleaning, we recommend using LAST RECORD PRESERVATIVE for total protection of your power-cleaned records. LAST applicators can become dirty and contaminated in the process of cleaning records and applying LAST RECORD PRESERVATIVE. They may be easily cleaned using the following operation. Place lukewarm water in a shallow pan or bowl. Stir in a few drops of dishwashing detergent. Place dirty applicators in the container and let soak for a few minutes. Remove the applicators for the solution and gently rub the velvet faces together to dislodge soil. Rinse under cool running water; blot with paper or cloth toweling. Allow to air dry and place into use. Note: Keep POWER CLEANER out of the reach of children.